After graduating from The Kubert School in 2008, Alex Konat began his career at DC comics with Gotham Gazette during the Battle for the Cowl event and has worked on a variety of books with them over the years. 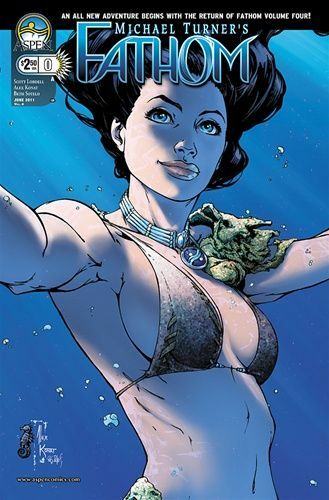 He has worked extensively with Aspen Comics penciling two full volumes of their flagship title, Fathom. He has also worked on several other titles for the company, including Mindfield, Eternal Soulfire and more. Alex has also done promotional work with 20th Century Fox for movies ranging from Deadpool 2, X-Men Apocalypse and Logan to Assassin’s Creed, Alien Covenant and more. He is currently working on a NuWay, a brand new title through Aspen Comics. I have several covers, including Fathom covers, and interiors from Alex going live on the site Wednesday and Thursday night! If there is anything you're looking for, please feel free to email me (TDArtSales@gmail.com). Lots of other updates are coming soon so be sure to keep an eye on the site, social media and read the newsletters! As a sneak peek, I have new art coming from Siya Oum, Joe Benitez and Cross (with some new lower pricing for many pieces from Cross) and a collection of art for sale by artist Jason Johnson!